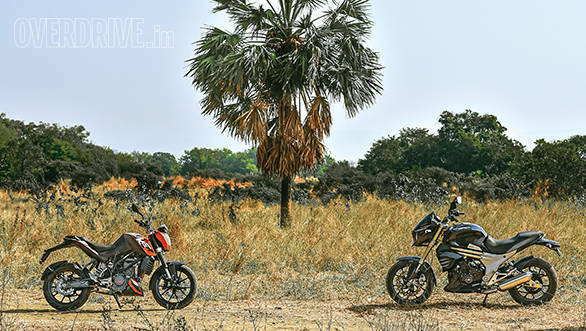 Ever since we road-tested the Mahindra Mojo last month, we've been wondering what the logical opponent would be for it to go up against in the inevitable comparison test. 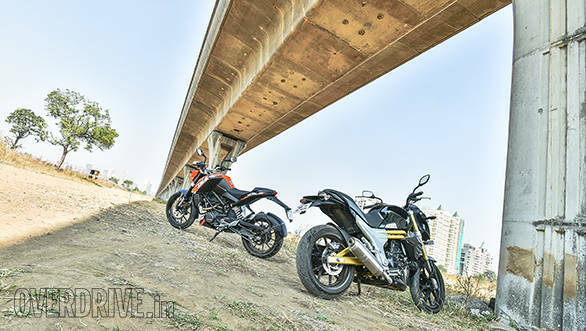 Being priced smack bang in between the KTM 200 Duke and the KTM 390 Duke, what nudged the battle towards the 200 was the fact that the kind of performance that the 390 delivers would have just made this battle very unfair for the Mojo, we wanted to find out if it really is worth spending the extra money on the Mojo and what it is that the motorcycle offers for that extra money. I've always maintained that looks are a very subjective, er, subject. It is a factor of personal taste and preference. Over the few days that I have been riding the Mojo, I've noticed that the motorcycle gets mixed reactions. What cannot be denied is that it has tremendous road presence. 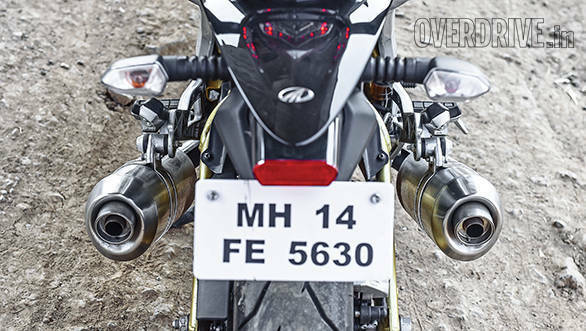 With that bulky front end, twin pod headlamps and that lovely petal disc up front, it looks like a much larger bike. The Duke is very honest about what it is  a small capacity, street naked. With the Mojo, I feel that the entire design is a bit imbalanced. The front end is really bulky, while the rear looks like it's off a dirt bike (love it!). The Duke looks a bit more balanced in terms of design and the bulky fuel tank and minimal everything-else lends it a sense of purpose. Then again this is just personal opinion. I have also met people (our lensman Suresh, for example) who think that the Mojo looks way better than the Duke. But one area where the Duke scores very clearly above the Mojo is in terms of finish. The paint and panel finish is evenly matched between the two, but when you start looking closely at the motor, the difference stands out. The Mojo's engine doesn't feel very factory finished. The paint quality isn't great and if you look closely, you can even find gaskets sticking out from between the engine parts. This is not to say that the Mojo isn't a well built bike. It feels pretty solid and like a motorcycle that will stand the test of time. This holds true for the Duke as well. Aside from the looks and quality, the first hint that both these motorcycles cater to completely different audiences is their ergonomics. 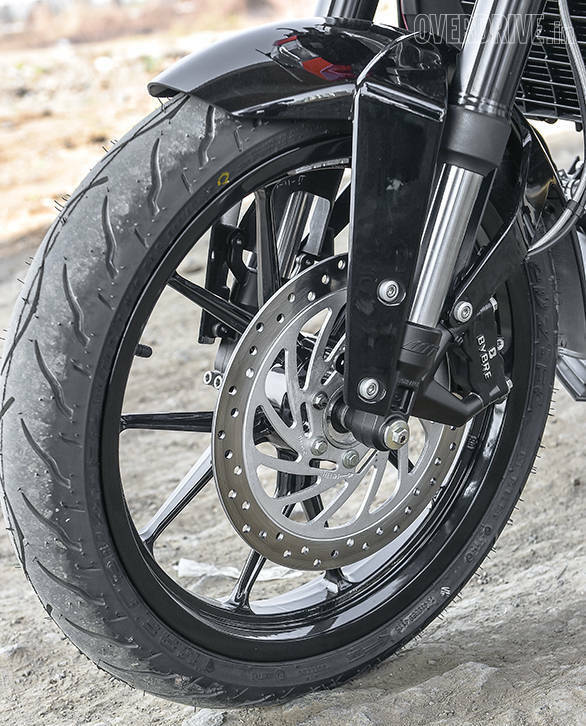 The Duke has a more focussed riding position with properly rearset footpegs, a wide handlebar and a taller, stiffer seat. The Mojo is a more relaxed motorcycle with its upright riding position. The handlebars are tall, the seat is roomy and the footpeg placement isn't aggressive. It hints at the more relaxed nature of the motorcycle. This difference in the nature of both motorcycles is most evident in their engines. They are both liquid-cooled singles, but that is where the similarity ends. The Mojo uses a liquid cooled single that displaces 295cc and makes 27PS and 30Nm of torque. This engine is mated to a slick 6-speed gearbox with well spaced out ratios. In comparison, the Duke uses a 199.5cc engine that makes 26PS and 19Nm of torque. Both engines are poles apart in terms of their character. The KTM's motor is a manic little number that loves to bounce off the limiter in every single gear. It is something that we have always loved about the Duke and is reminiscent of the company's roots that are firmly founded in off-road motorcycles. The motor is always eager to rev its head off and together with the close ratio gearbox, slamming into the limiter in top gear is an easy task  exactly the opposite of what the Mojo feels like. The Mahindra has an easy revving engine that will go all the way to the redline if you want, but prefers being all mature and dignified. It makes way more torque (11Nm more, to be exact!) and prefers to ride that wave of torque through every single gear of the 6-speed 'box. The ratios are wider spaced, so you can stay in the gears for longer. It is a much calmer experience, the result of which is quicker acceleration. 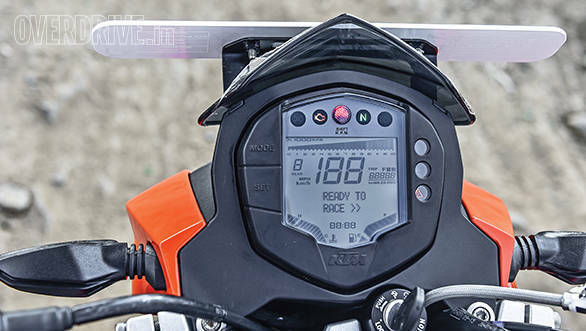 With all of the extra torque being delivered right in the mid range, the Mojo hits 100kmph in 8.6 seconds  0.7 seconds quicker than the Duke's 9.3 seconds. 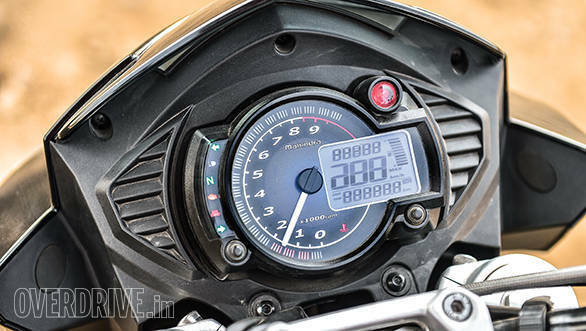 The extra displacement and longer gearing helps in top speed too, with the Mojo clocking 142kmph to the Duke's 133kmph. Another area where the extra displacement helps is in refinement. Being an engine that is less stressed, the Mojo is a lot more refined. It revs smoothly and doesn't buzz as much as the Duke at high revs. You can rev it all the way to dangerously close to redline in top gear and feel relatively at peace. So, if somebody were to ask me which motorcycle performed better in a straight line, I would have to say it is the Mojo. It betters the Duke in more ways than one  acceleration, top speed and refinement. But not by much. The difference in fuel economy is too negligible to need comment. Just like the engine, the characteristics of the chassis on the two bikes are also quite different. The Mojo leans more towards the more comfortable side of the spectrum while all the Duke wants to do is go up and down a set of twisties silly fast. The suspension components on both bikes are pretty similar. Both use upside down forks (both made by Endurance, by the way) and a single shock at the rear. However, they are tuned very differently. The Mojo is all plush and nice with phenomenal ride quality. But in the process of making it super comfortable, the sense of excitement has been lost. You sense that had the engineers made the effort to create a chassis that is attuned to the kind of performance the engine delivers, you would have had a truly incredible motorcycle. That said, it isn't a bad motorcycle as is. It handles everything that you subject it to with ease. 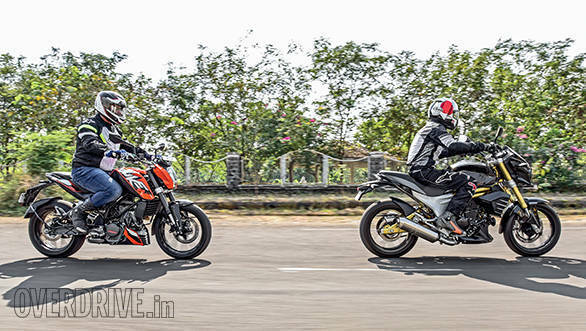 The problem is that in this test, it is up against the KTM 200 Duke. The Duke has been our benchmark for handling in small capacity sports motorcycles ever since it came out a few years ago. The ride quality may not be as nice as the Mojo, but with that stiffness comes a wonderful directness in handling. The moment you switch over from the Mojo, you feel the difference. The front end inspires tons of confidence and the turn in is quick and precise. While the Mojo is not all that happy about tight switchbacks and prefers the long sweeping corners that doesn't require aggressive inputs, the Duke lives for them. A lot of this has to do with the long wheelbase of the Mojo (115mm longer than the Duke) and the higher rake angle. These two factors take away all the sharpness that the motorcycle could have had. The Duke on the other hand feels razor sharp. As a result, it is a much more rewarding motorcycle to ride hard around corners. That said, the softer suspension setup and more comfortable ergos make the Mojo a very comfortable bike to tour on. But considering the number of kilometres we have clocked on the various Dukes at OVERDRIVE, we can safely tell you that if you put your mind to it, there is no distance the Duke won't help you cover. 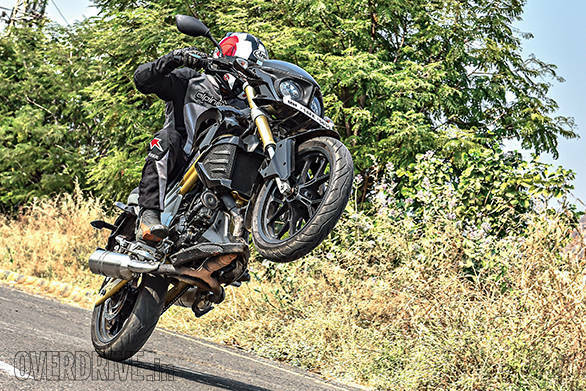 At Rs 1.89 lakh (on-road, Mumbai), the Mojo is a fair bit more expensive than the Duke (Rs 1.64 lakh). But does that Rs 25,000 get you more motorcycle? Not exactly. After having ridden both bikes back to back, it is clear that these are two motorcycles that cater to two entirely different types of motorcyclist. If you are the kind who likes a comfortable motorcycle that does well on highways and is a relaxed ride in the city, then the Mojo is the bike for you. 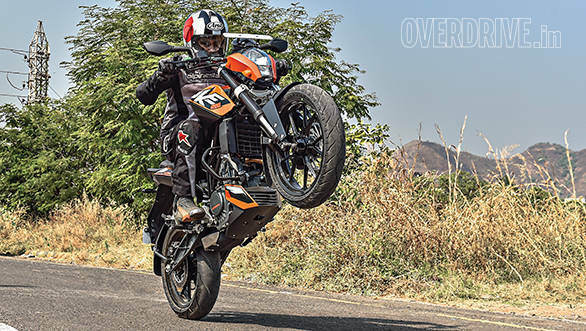 On the flipside, if you like riding your motorcycles fast and hard and demand the kind of confidence that such riding requires, the KTM is the motorcycle for you. Personally though, I think that despite the small difference in performance, the KTM still brings a lot more to the table than the Mojo. With the Mojo, there is still a sense that things could have been done better. 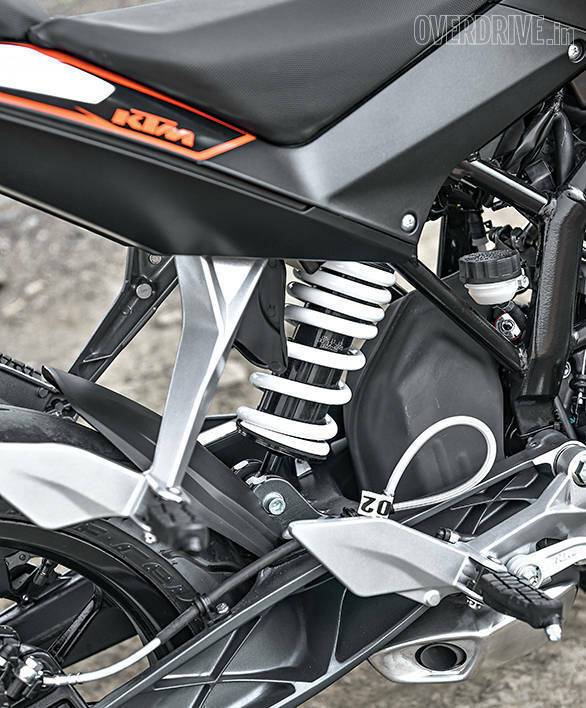 The KTM, on the other hand, feels like a complete package straight out of the box  a well thought-out, focussed motorcycle. And that's why the Duke wins.